Copyright photo by Matt, blog giik.net/blog. 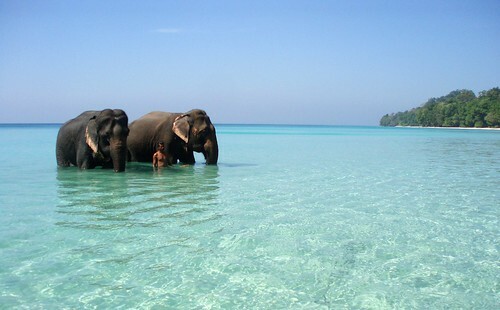 This gorgeous photo was taken in India, seemingly in the same island area as the video clip of swimming elephants in my previous entry. I would love to be there! Click on the photo, and you'll see that the photographer uploaded a large size photo with personal-use download permissions. It's been on my computer desktop all week. This is one of my favorite elephant photos of all time. ...I'm really not into buying a lot of elephant tsotske's. * This little wooden elephant at an antique store in Duncan Mills amused and tempted me for a moment though. Like wild elephants, I'm happy to take his photo, but I don't need to take him home. *A Yiddish word, pronounced (chotsh kuhs) that means "trinkets," or "souvenirs." Also comparable to the American slang words, "knick-knacks," or "bric-a-brac." My passion for elephants means that I always notice them used decoratively or for sale in retail boutiques. If there's a silly stuffed elephant on a store rack somewhere, my impulsive inner-child is going to stop and play with it. I can't help myself. When I was at the Mandalay Bay Hotel in Vegas recently, each morning I enjoyed pushing through the glass doors with the brass elephant heads on them. Upon entering an import store like Cost Plus, or an Indian goods emporium, I always make a beeline to the collections of Ganesh sculputures. It's a game for me to discover which statues truly channel the energy of Lord Ganesha and which are the cheap imitations. *A Yiddish word, pronounced just like it's spelled, that means "to be aggravated beyond bearing," accompanied by falling backwards onto the floor in an exaggerated fainting movement. What disturbs me even more though are the clown-like circus elephants. I'm not talking about the East Indian sacred elephants that are also shown in decorative costumes, though those disturb me a little too. No, what gets me all uptight are the circus images, that are portrayed as cute, but that make me think of cruel trainers who beat and torture my sensitive elephant friends into submission. Knowing what I do about elephants, that type of imagery* leaves me feeling queasy and a little angry. *I thought about inserting a photograph as an example here, but even thinking about it makes me feel testy, so I won't. So while I absolutely adore elephants, and have an irresistable fascination with seeking them out, I'm particular about my likes and dislikes. Discernment is a vital part of any collector's ability to maintain standards of what is uplifting and pleasurable, and what is merely an obsessive need for distraction. I have very little in the way of elephant art in my homes. I have the tiniest of Ganesha statues (I call him Lil' G) on a window sill at my retreat house. I have a beloved bronze trio of elephants that hold a rose quartz crystal ball on my desk. Unless I'm forgetting something, that's all. I do have room for a large Ganesh statue in my entry way, and will frame some travel photos one of these days. I'm definitely on the lookout for the perfect gold elephant ring for my right hand. But until I find the art pieces that really make my heart sing, I'll wait. Good things are worth waiting for. 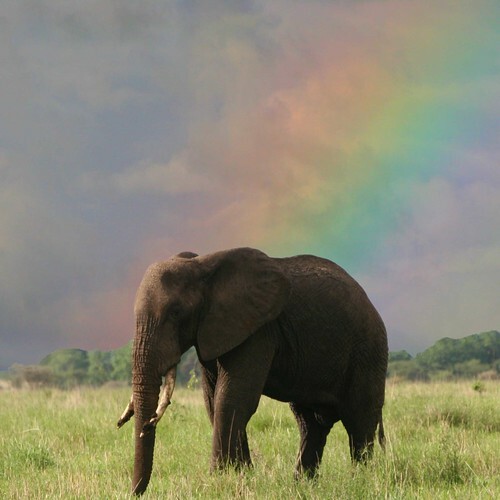 The photographer's caption for this magnificent photo says, "A dramatic rainbow appears behind an elephant in the Tarangire Game Reserve, Tanzania, Africa." What a spectacular moment caught on film! People have been telling me about The Sultan's Elephant travelling street theater in London last May, but this clip shows why it was so remarkable. Look at how beautifully they made it walk!